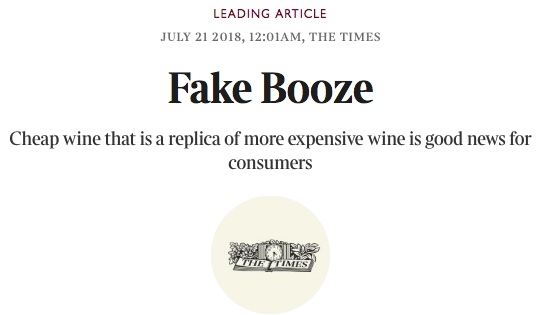 Wine is just something most people drink for the alcohol so the industry should get ready for the "fakes"
The Times of London has given the world wine industry some words of wisdom that it would be wise to heed. Watch the short video and then read the Times' editorial. In The Commonsense Book of Wine, Leon Adams said that “anyone who tries to make you believe that he knows all about wines is obviously a fake”. That is even more likely now that the wine itself might be a fake. A company called Replica, using formulas devised in food laboratories in Colorado, has found a way to mimic the flavours, textures and bouquets of some famous wines so closely that, in a test set up by The Times, a renowned sommelier was unable to tell the difference between Kendall Jackson chardonnay and its replica, Knock Off. Wine is priced at the moment rather like luxury goods. The price is a signal of the brand value rather more than the actual cost of production. The fake wine series is upsetting this process. A bottle of The Prisoner goes for $50 but its knock-off competitor Pickpocket retails at $20 a bottle. Traditionalists in the wine industry find this irritating and mutter about the legal implications of claiming that a wine tastes just like a rival. However, there is no suggestion here of hoodwinking the customer. Calling the brand Knock Off means that it does exactly what it says on the bottle. Besides, it is not possible to make a copyright of a flavour in a food or drink as taste is so subjective. The love of wine can surely stretch to both bottles. Anyone who wishes to demonstrate fashionable superiority can parade the expensive bottles through the supermarket while those who just like the drink can enjoy it at a cheaper rate. This has to be better than the way luxury goods companies such as Cartier and Burberry have preserved their brand value — by pulping unsold stock. Most fakes are, by definition, undesirable, but fake wine may be an exception. Maybe it even holds the key to a modern curse. If in vino veritas still applies to fake wine, then we might have found the solution to fake news.